Backyard decks and patios are becoming more popular these days because of the variety of different style options offered today. 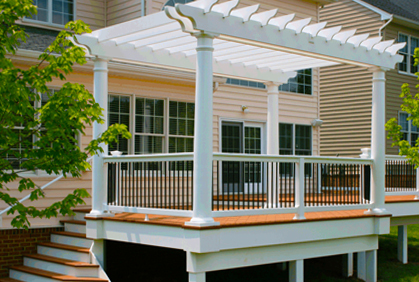 Deck designs are becoming more elaborate, often extending or taking the place of other rooms in the house. Many decks have been transformed into an outdoor kitchen complete with a stove top grill and cabinetry. Others have been converted into outdoor living rooms complete with sofas and an outdoor fireplace. But aside from being decorated as an extra living space, decks can be designed in any way to fit both your needs and your style. With the addition of simple deck roof ideas you can protect yourself from unwelcome weather, thus extending the time you can use your deck. This article focuses on wood deck stain colors and how any homeowner can use for a DIY project to revamp their deck. 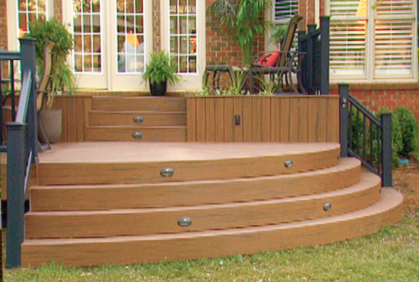 Although there are a variety of different types of materials to use for decking, the most commonly used is wood. Outside wood decks are not only the most aesthetically pleasing, but they are also very durable and go with almost any exterior décor. Engineered wood is called composite decking and is made from a combination of plastic and wood fibers making it more decay resistant and long lasting. Whether you choose natural or composite wood, both materials are easily stained to whatever color you desire. The first step in staining a deck is picking the stain. At your local hardware store to search their collection of different wood deck ideas for colors of stain. 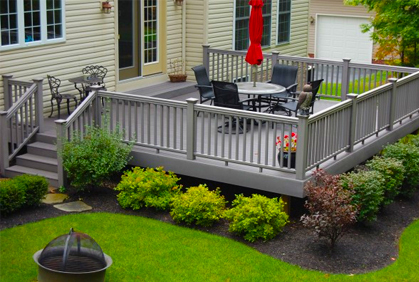 If you are looking for a drastic color change you can easily make your deck a darker shade by buying a darker deck paint colors. However, make sure to stay away from the reddish tinted stains because those tend to fade quickly and diminish the appearance of your deck. Remember that you don’t have to settle for just one color. If you are trying for a more eclectic look you can use two tone deck stain ideas to add more pizzazz to your home exterior. You can pick colors that are similar for a more toned down subtle look or you can pick a light and a dark color to add a little more excitement to your deck. Different woods require a different work like cedar wood deck stain should also include a coat of sealant before and after in order to maintain the color. 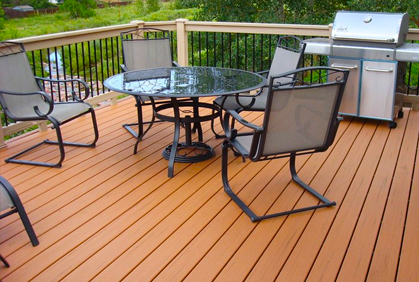 The best wood stain for decks should be one that is specifically marked for exterior use. In addition, it is a good idea to choose a type of stain that is more opaque than clear. This is because the best exterior deck stain is opaque colors because they offer more protection from UV damage from the sun, thus increasing the longevity of your deck stain. Once you have picked out the color you are ready to begin the staining process. Before breaking out the stains, make sure to clean your deck properly. Sand down any bumpy spots then sweep off the area with a broom to remove any unwanted dirt and debris. It is important to use a deck cleaner that was made specifically for your type of wood and to follow the instructions printed on the label. After washing the deck rinse it off and then let it dry. After the deck has dried apply a wood sealant. The sealer helps maintain the lifespan of the wood and prevent it from damage and decay. Once the sealant is dry, you can begin to stain. How to stain a wood deck depends on the size. If you have a small deck design one roller should be enough, but if you have a large deck you may want to consider a larger brush. Starting from one corner and working your way to another, apply a thin layer of stain to our deck. Thinner layers will allow for a lighter color whereas thicker and more layers will make the staining darker. The number of coats will depend on both the type of wood and the color you are trying to achieve. After applying the initial coats of stain and allowing it to dry, you are now ready to apply the sealer. 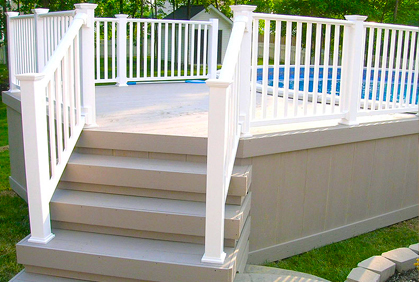 Stain sealer is an important addition because it protects your deck and helps the wood to maintain color longer. 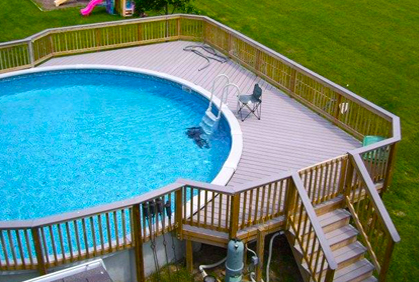 The best deck stain sealer will be epoxy fortified to resist UV damage and maintain color, water resistant to protect the wood from rot and mold, and UV light resistant to protect your deck from sun damage. Once you have cleaned, stained, and sealed your deck and allowed it to dry, you can bring back your patio furniture and begin to enjoy your remodeled outdoor living area.